The Fan Energy Zone, powered by SAP, was an e2k-designed feature activation for the Super Bowl 50 Host Committee. 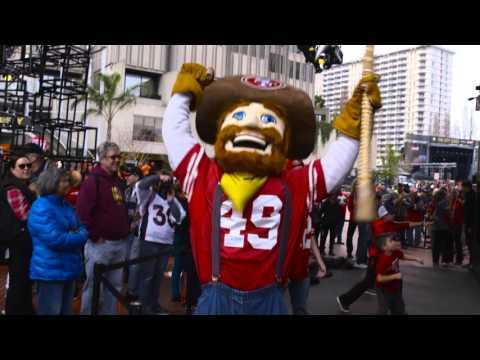 The Fan Energy Zone electrified Justin Herman Plaza in the heart of Super Bowl City for 10 days leading up to the game. An estimated 1.1 million people visited Super Bowl City and experienced the free-to-the-public Fan Energy Zone experience: nonstop entertainment and DJs, state-of-the-art visual technology, and immersive gaming. In the 40-foot tall Fan Dome, visitors played interactive, motion-capture games as digital avatars on giant screens. Their gameplay was commemorated in a digital player card in the official Road to 50 app. At moments of peak intensity, the Fan Dome exploded in a sound and lighting celebration. In a week-long tournament to win Super Bowl tickets, fans played the motion capture games Breakaway and Amp It Up, developed by Britelite Immersive, and the VR-based Quarterback Challenge from Helios Interactive. The Light Cycle experience partnered Symmetry Labs with the Cannondale team at Cycling Sports Group. Fans cycled for their favorite NFL Team and for bragging rights in a fast and furious race to the top of the Sugar Cube LED light sculpture. The Fan Wall was a 50-foot wide by 15-foot tall ultra-definition LED video wall that captured the visual and virtual excitement of Super Bowl City. It displayed live stats from the Fan Energy Zone games on gorgeous high definition leaderboards designed by Britelite and the SAP d.studio. The Fan Wall also showed fan social media content, advanced demographic and beacon-driven data visualizations, and live feeds from NFL Network and CBS KPIX. Concerts at The City Stage, presented by Levi’s® were fed live to the Fan Wall, including performances by Alicia Keys, OneRepublic, The Band Perry and Aloe Blacc. From January 30 to February 7, The Fan Stage served up nonstop entertainment in the heart of Super Bowl City. More than 100 performances and special presentations took place in the Fan Energy Zone, including the Host Committee Opening Ceremonies, community music and dance performances, extended sets from celebrated Bay Area DJs, NFL player appearances and selfie sessions, and the official AFC and NFC pep rallies featuring the Carolina Panthers and Denver Broncos cheerleading teams and mascots.